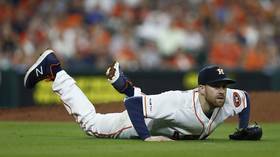 Houston Astros pitcher Collin McHugh played out a scene from Hollywood blockbuster &apos;The Matrix&apos; when the MLB star showed incredible reflexes to dodge a ball rapidly coming his way. McHugh was pitching to Oakland Athletics slugger Kendrys Morales, who fired the ball back at him chest-high at around 90 miles per hour in their game on Tuesday night. And, just as Keanu Reeves’ character ‘Neo’ dodges bullets in slow-mo style in The Matrix, McHugh showed amazing reaction skills to bend backwards just in time to see the ball whizz inches from his face. The Matrix comparisons were picked up on by a number of social media users – including the official Astros and MLB accounts. Some, however, rather flippantly remarked that Neo had remained on his feet in the Matrix before returning upright, whereas McHugh had slumped to the ground afterwards. Keanu Reeves didnt fall. Anyone can bend over and fall down. Still, it was pretty impressive given his feat was very much fact rather than the stuff of Hollywood science fiction. McHugh, 31, eventually helped the 2017 World Series champions claim a 9-1 victory over the Athletics at the Oakland-Alameda County Coliseum. Published on Wed, 17 Apr 2019 15:31:08 GMT, © All rights reserved by the publisher.